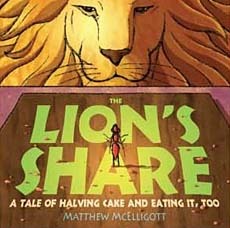 (1st grade - 3rd grade) In this beautifully illustrated picture book, lion has baked a cake for his friends, but each of his greedy friends takes half the cake when it's passed to them, leaving Lion with only a crumb. Ant feels bad and offers to bake another cake. The others hear this, and not wanting to look bad, each offers to likewise bake cakes for the lion, but they each try to outdo each other, promising twice the cakes promised by the previous guest. Soon, hundreds of cakes are being promised and the result is quite comical. This is one of our favorites for teaching fractions as well as for teaching multiplication, division, and even generosity verses selfishness. In a starred review, School Library Journal said "The captivating ink and watercolor illustrations... reinforce the mathematical theme with humor and detail. Many layouts effectively present a graphic display of the simple fraction concepts. The results are terrific." 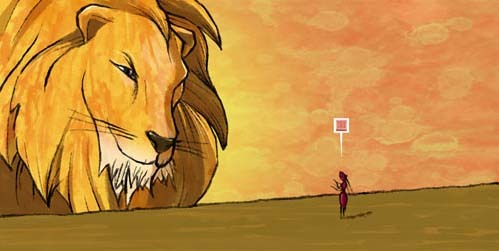 Below are sample pages from inside The Lion's Share.